Evan Hochstein is a passionate STEM education supporter and long time FIRST Tech Challenge team mentor, volunteer, and alum. He currently works with the Applications Engineering Lab at the North American Headquarters of Stratasys located in Eden Prairie, Minnesota. Most weekends, you will find Evan working with FIRST teams or trying out a new 3D print on one of Stratasys’ PolyJet or FDM technologies. When did you first become a member of the GrabCAD Community? I first joined the GrabCAD Community back in January of 2015 thanks to GrabCAD’s sponsorship of FIRST. I found that GrabCAD was a great way to collaborate with fellow robotics competition participants and I believe communication is key to any team that is looking to succeed. GrabCAD was the perfect catalyst to make this happen on the robotics teams I worked with. 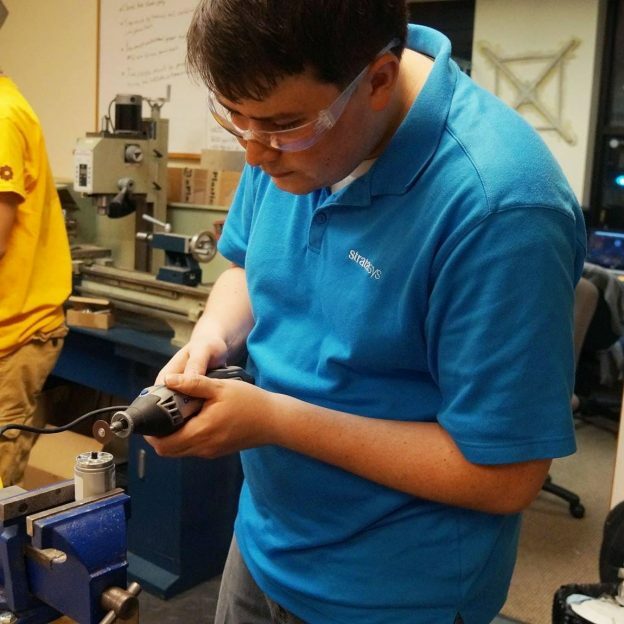 Evan Hochstein working with a collegiate robotics program team called ‘Snow Problem at the University of Minnesota. After GrabCAD Community and the Library, what other products do you use? Workbench for CAD file revision tracking as well as communication between team members and mentors. It is a great tool to collaborate with others. Everyone can look at and understand a 3D model, take screenshots and comment for revisions and improvements. And I use GrabCAD Print for review of CAD files before 3D printing them. How do the GrabCAD suite of products combine to make your work life simpler? GrabCAD Print has completely changed the way we plan, process, and queue jobs on our Stratasys 3D printers. Before we were working between multiple 3D printing software technologies depending on the printer. Now we have simplified this to one software and one process – GrabCAD Print. Not only can we process and queue parts, but we can also implement smart business tools to track material usage and machine utilization in order to better plan for the future. GrabCAD Print has significantly reduced our frustrations as well as time spent trying to process and queue jobs on Stratasys 3D Printers. I run a shop of 23 printers, so it’s really hard to keep track of all the jobs. GrabCAD Workbench and Print are great because I am able to track many job requests easily and keep track of material usage across multiple Stratasys printers. I can use this data to forecast material consumption and make smart decisions when buying the right amount of new material to ensure it does not expire. With GrabCAD Print’s recent introduction of Workbench files we are looking at creating a process around managing our files through Workbench before printing with Print. It is almost morphing into an ERP/CRM system to improve our work as a print shop. From an educational perspective, the GrabCAD Community is a huge asset for sharing robotics projects; just search for “FIRST Robotics” and a ton of robotics models pop up from K-12 students. This is driving CAD collaboration for the future – as these students graduate, go off to college and start their careers they’re always going to remember the GrabCAD Community.